A special thank you to our Junior Correspondent, Lizzy, for reviewing this series! Have you ever longed for a pony? Lauren Foster has. And when her family moves to the country, her dream finally comes true. But when she reads a story about a perfectly ordinary pony who turns into a snow-white unicorn, she starts to look at her own pony, Twilight, and to wonder, maybe . . . Just maybe . . .? When we first moved to Oregon mommy got me a big stack of books from the library. I looked through to see which ones I liked. I got to this unicorn one called, My Secret Unicorn and I thought I would give it a try. When I read through the first few chapters I ran out of my room and shouted, “This is the book for me!” After reading the first few books quickly I wanted to read the rest but they didn’t have the rest of the series in America . So, my aunt Mary sent me the rest from Scotland . As soon as I got the books I read them so fast. Maybe in a few weeks. 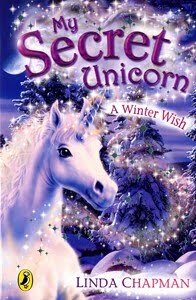 I loved the unicorn books so much. Here’s what I loved about them: I loved that it was about unicorns, and I love unicorns. I love how the story changed from book to book. I love how the unicorn has friends and how Twilight helps his friends and is not conceited. My favorite part of book one was when Lauren gets the animal that she really wants, a horse. But the horse is even better than she thought! Read the book to find out what happens. Check out author Linda Chapman's website for cool downloads, activity sheets, and more about Twilight and the gang! 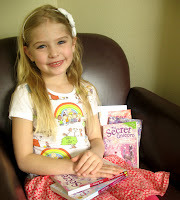 My daughter LOVED these books! We always bought them in Britain because they came out so much earlier there! Awwww, how precious. Unicorns ftw! How adorable! I'll have to read one of these books. My nephew might like them; he loves magic & fantasy! Sounds very cute, can't wait to get it for Hailey who is also 6 yrs old. Thanks for the review, Lizzy! GREAT review Liz! I wanna pick these up and see what's so great! I saw new Linda Chapman books today at the book store. I'll send them to you. They are about ice skating! Looks really cute.